Like many people, I’m a sucker for stories and situations that demonstrate the fundamental flaws in the human mind and senses. Whether it’s a video that hides a moonwalking bear to prove a point about visual awareness or a magazine article explaining how we create false memories, the tricks our brains can play on us are a fount of inspiration for art and philosophy. I recently encountered cinematic evidence that again proved that, despite our best efforts—and even when we believe in advance we know what we’re seeing—great art can still make you question your own mind. A number of years ago, we ran a piece wherein film critic Mike D’Angelo delved into the visual trick that drives the entire plot of Lucrecia Martel’s The Headless Woman. (This explanation could be considered a spoiler of sorts, but since my entire argument is about the idea that foresight doesn’t matter, please brush aside such concerns.) The Argentinian drama follows a woman, María Onetto, who hits a dog with her car, and then withdraws from life, unraveling as she suspects she actually ran over a child. At least, that’s the actual content of the film—the subtext and suggestion numerous people take away is quite different. D’Angelo delves into the strange phenomenon by which many critics and viewers of the film genuinely believed there to be some ambiguity as to whether it was a dog or child. He unpacks the way Martel’s use of cinematic grammar simultaneously conveys (in no uncertain terms) that this was a dog, even as establishing shots and imagery create a subconscious link between incident and child. D’Angelo argues this makes for a demonstration of our desire for mystery where there is none, and that, rather than the film itself being a study of how someone’s internal fears and anxieties lead her to a mental breakdown, it instead becomes a strange leap in which the audience occupies the position of the resolutely uncertain subject, convinced Onetto may be right. Rather than seeing how Onetto’s mind fools her, we allow ourselves to be fooled. I finally got around to watching The Headless Woman this past week, and decided to revisit the article prior to sitting down with the Blu-ray. So all this discussion of the faulty nature of people’s eyes and assumptions was in the front of my mind during that early scene of the accident. And guess what: It didn’t matter in the slightest, because I came away from the scene thinking it might have been a child’s body in the far background of Martel’s shot. I had literally just read an unpacking of how the scene clearly depicts a dog, and the mistaken interpretations our brains make thanks to visual cues, and I still found myself thinking the scene was ambiguous. Advance knowledge of the entire debate was rendered moot by Martel’s masterful construction of the sequence. Whereas D’Angelo finds this “mistake” makes for a less interesting movie than if we’re secure in the knowledge of what actually happened, I disagree. It reminds me, oddly enough, of the first T. rex attack in Jurassic Park. Spielberg deliberately shows us the pen on the opposite side of the fence next to the stalled jeeps, and we’re treated to a clear shot of the dinosaur walking out onto the road—then, minutes later, the protagonists are rappeling down the side of a sheer drop. It asks us to ignore a deliberately nonsensical geographical outlay, and we do, because Spielberg’s control of visual language and editing lets our minds gloss over the error. Martel is performing the flip side of the same feat—giving us a clear depiction of reality, and then letting our own senses betray that simple clarity. We create our own hundred-foot drop where there isn’t one. By this point, most music fans are familiar with the legend, at least, of Big Star: the cult band that released three superlative albums that sounded like little else in the ’70s, then disappeared, only to be dragged into the spotlight by fervent fans like The Replacements years later. But the story behind why one of the best bands of the ’70s never really made it big is as fascinating as it is tragic, expertly translated by Drew DeNicola and Olivia Mori in their 2012 documentary, Big Star: Nothing Can Hurt Me. Even though the band’s initial releases—#1 Record and Radio City—were rapturously embraced by critics blown away by the emotional turmoil tucked into these hypnotic pop songs, various label red-tape struggles prevented Big Star records from being distributed widely. Inner-band conflicts didn’t help. Chris Bell died in a car crash at the rock-star death age of 27 and Alex Chilton joined a punk band, but a certain song on The Mats’ 1987 album Pleased To Meet Me helped the Big Star legend begin to unfold. The film is a fascinating look at the recording process, the business of being a band, and fandom and creativity overall, with interviews with Big Star admirers like Mike Mills, Robyn Hitchcock, and Paul Westerberg, as well as the band members themselves. It’s well worth the few dollars it will cost any current/future Big Star devotee to stream on Amazon or YouTube. I’m no different from most of my colleagues (including A.A. Dowd, who wrote our review) in that I got a big rush out of Edgar Wright’s caper/needle-drop extravaganza Baby Driver. But I have some reservations about its thin, student-film-y love story. 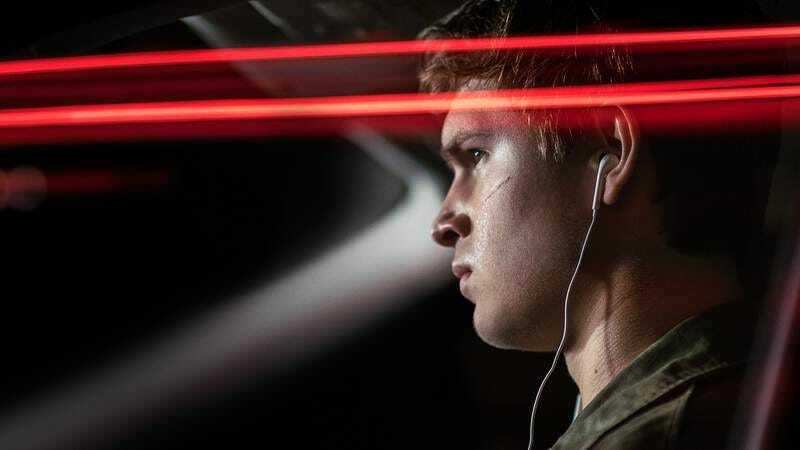 The perpetually plugged-in getaway expert Baby (Ansel Elgort) and the conveniently beautiful and underwritten waitress Debora (Lily James) are such archetypal figures of post-adolescent wish-fulfillment—the headphones, the diner, the cross-country road trip—that the whole thing feels like a step or two back from Wright’s Cornetto Trilogy, whose slacker worldview at least showed some growth. I’m not the type to demand perfection, moral or otherwise; a critic has to recognize that flaws are part of what makes art so obviously personal and human. But given Wright’s romantic mindset, a better romance could have helped. But what am I grousing about? Part of what makes Wright so appealing as a filmmaker is the way he holds tight to the initial, often teenage pleasures of movie-buff-dom and regenerates them through an impressive technical know-how and an extreme focus on choreographies of camera movement, cutting, scene structure, and dialogue. (The car chases here are head and shoulders above anything in the Fast And Furious movies.) Maybe that’s why his protagonists have so much trouble growing up and letting go. His heroes are all creatures of routine (sometimes soul-crushing, though not always), and the central conflicts of his movies all seem to involve characters being forced out of their comfort zones: Gary King and his faded cool, Scott Pilgrim and his wussdom, Baby and his headphones. Speaking of which: the countless musical sequences, which seem like an experiment to see how many songs can be crammed into one film, do a damn good job of evoking that great teenage fantasy of the cosmos perfectly choreographing itself to the sound in your headphones. The gold standard remains the transformative use of David Bowie songs in the films of Leos Carax; the oft-quoted “Modern Love” sequence in Mauvais Sang is the most famous example, but I’m thinking here of the way the obscure, aptly titled early single “When I Live My Dream” is deployed in a memorable sequence from Boy Meets Girl, which is embedded above. Wright and Carax are radically different filmmakers, but though I wouldn’t call either juvenile, they share a similar creative ethos—something expressing emotion in film by combining or reconstructing all those things about movies, music, and art that gave you your first highs.